We celebrated today by finally finding a spot for E’s very own blue glass ball for his room (a gift from Auntie Beth). I wish I could capture in my memory forever the way his smile looks – full of wonder and joy – when he watches it spinning. He also took approximately two steps! He got carried away by excitement when we sat down with him to practice, and seemed to forget to be cautious – but we think it was a bit of a fluke. Won’t be long now, though! We also had a visit with M, our day care lady, and he stayed with her while his Mama did errands, warming up for his first full day of care tomorrow. All went well! They went to the river and had raisins and watched geese. M is quickly being won over by all the kisses and words. His kisses are THE BEST. He has learned to purse his lips a tiny bit (and keep the tongue in) and always says “Mmmm”. 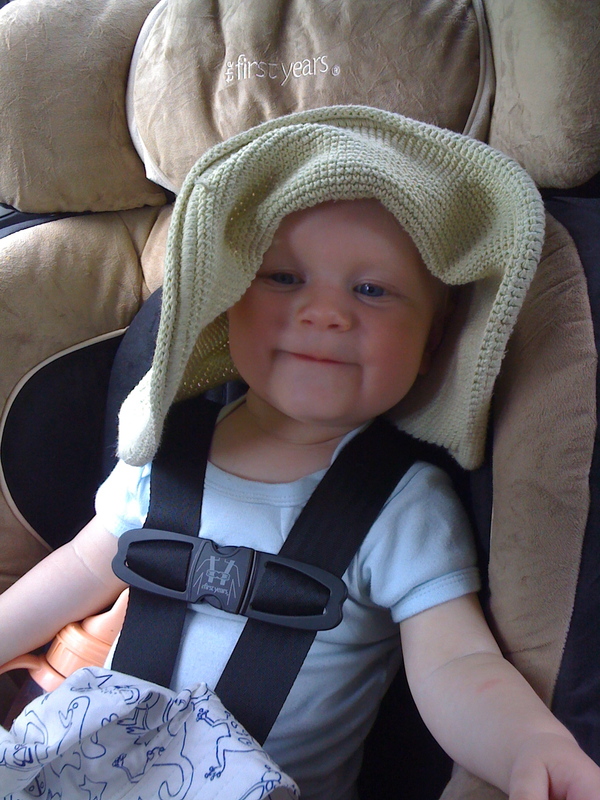 E is imitating practically everything we say now, in earnest. When Sean sneezes and I say “Bless you!” E follows up with “Bashew!” Yesterday he finally said “Grammy” (as in my mom, not the music award) in a recognizable way, which was thrilling to us all. And tonight, Sean and I doubled over laughing as he picked up the phone, held it up to his ear (upside-down), and said “Hellooo!” several times, in a sing-song, comedic-secretary voice. His word count is up past 150 at this point – he’s adding new words so fast, it’s almost scary. 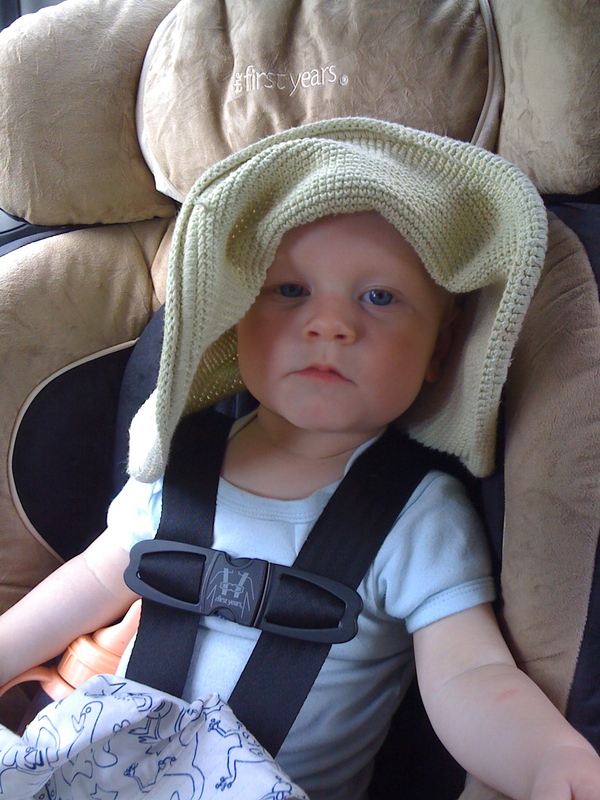 Like, he’s a baby right now, so he’s all cute and can’t wreak TOO much havoc… but I have this feeling he might be way smarter than either of his parents, and eventually he’ll have dominion over all of us. Well, I guess he kind of does already. 🙂 We just have to make sure it continues to be an affectionate dominion, as opposed to an evil genius one. The other day, I was playing with E on the floor, and he was laughing big enough that I could see into his mouth… and realized he has all kinds of teeth in there! Two or three canines and at least three molars starting up! I feel bad for not knowing sooner – but at least this explains the “out-of-nowhere” (ouchy screamy) diaper rash he developed this week. He puts hats on himself at every opportunity. 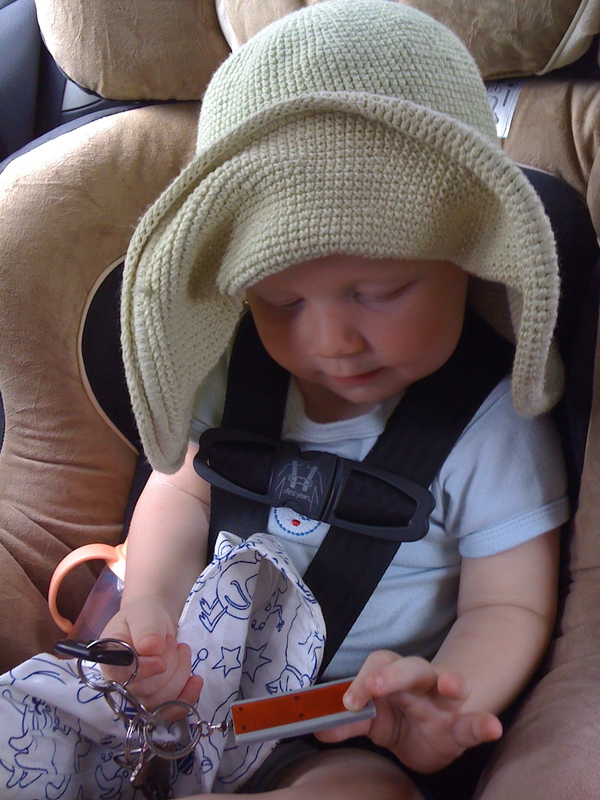 Here are some photos of when he picked up Auntie Em’s hat during a car ride the other day – we looked back and there he was, all fashionable. We love him SO. MUCH. P.S. My first day of school was fun – low-pressure activities, kids were lovely (honeymoon! ), and as a planning teacher, I even got to attend the “This year we’re all going to have the best year yet, and be kind and not litter” assembly twice. How was your day? My day always gets better when there are Baby Bits. great to come home today and talk about helmets and napkin rings and other fancy things. and watch E make out with the bird toy. mmmmmmmmmah! I agree with yerpa. and emoley.